Active kids require good nutrition to grow up healthy. A substance normally found in the brain called DMAE may increase vigilance and alertness. Magnesium plays a role in many metabolic processes, and neuromuscular transmission and activity. L-aspartate, a nonessential amino acid, acts as a neurotransmitter. Grape seed extract, rich in antioxidants, may help with healing wounds, improving bone strength, preventing cognitive decline and more. 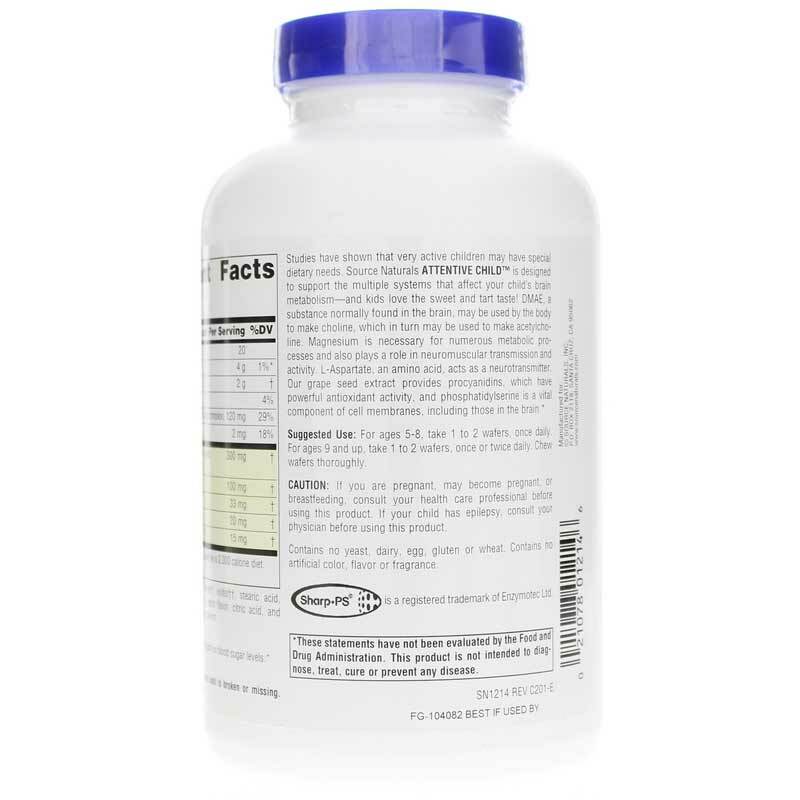 Phosphatidylserine, which may aid in memory, plays an important role in the building and growth of cells in the body. Source Naturals offers a children's supplement that contains all of these nutrients called Attentive Child. 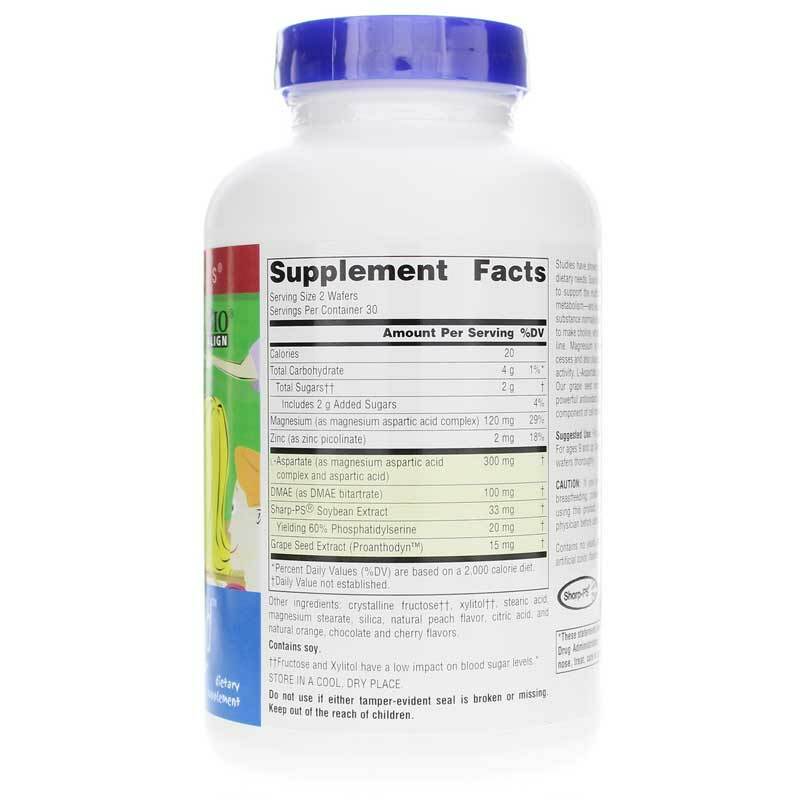 It supports the multiple systems that affect a child's brain metabolism and enhances mental concentration. Attentive Child has a great sweet and sour taste that kids love. 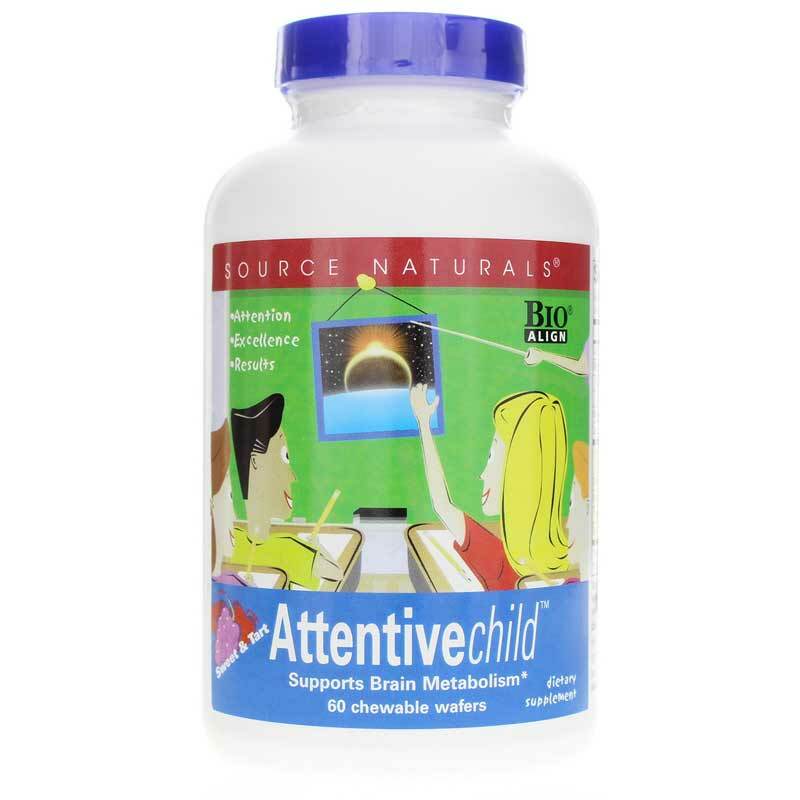 If you're looking for a children's supplement that supports brain metabolism and enhances mental concentration, check into Source Naturals' Attentive Child. Order online today! Other Ingredients: crystalline fructose**, xylitol**, stearic acid, natural peach flavor, magnesium stearate, silica, citric acid, and natural orange, chocolate and cherry flavors. Contains NO: yeast, dairy, egg, gluten, wheat, salt, preservatives or artificial color, flavor or fragrance. Suitable for vegetarians. Less than 75 pounds - take 1 to 2 wafers daily. More than 125 pounds - 3 to 4 wafers daily. Chew wafers thoroughly. **Xylitol and fructose have a low impact on blood sugar levels. If you are pregnant, may become pregnant, or breastfeeding, consult your healthcare professional before using this product. If your child has epilepsy, consult your physician before using this product. Keep out of the reach of children. We've used this product for many months for my son's ADD/ADHD symptoms. When we got to summer vacation I asked him if he still wanted to take it and he yelled YES!! He's 13 and says it works GREAT! I bought these for my 7 1/2 year old son. My son does not particularly care for the sweet & sour taste of them. He says they taste like very sour SweetTarts, and he is not a huge fan of those. But he does take these every morning and we have noticed some improvement. So gross n tart my child won't even take them! I have one child with severe ADHD and another with High Functioning Autism Spectrum Disorder/Global Development Delay/Sensory Processing Disorder, each of them uses this and we have noticed a difference in focus, calming, which helps with them being able to do well overall! I received some of these as a free sample at a kids expo. My 6 year old has had trouble concentrating in school so I gave them a try. He absolutely loves taking them and he has been doing much better at getting his work done in class and staying focused on projects. They were definitely work the price!